This stylish window curtain panel features a solid pattern and blackout design to add elegance and function to any room. Experience the darkness, silence and beauty of Eclipse curtains. Eclipse blackout panels have been laboratory-tested to block out over 99-percent of intrusive light, unwanted noise and can help you save on home heating and cooling costs. Eclipse curtains offer a unique blend of fashion and function for any home decor. Transform your media room into the ultimate home theater experience, or create ambiance in your dining area. National Sleep Foundation studies show that reduced light and noise are optimal for a better night's sleep. Eclipse Curtains are perfect for the bedroom, kid's room or nursery, providing the ideal sleep environment for the whole family. The magic is in the Thermaback construction. The innovative foam-backing is applied to the fabric and allows you to enjoy all of the light-blocking, noise reducing and energy saving benefits, while providing the same fashionable style and elegance of naturally flowing curtains. Hang two or more curtain panels on a standard or decorative rod for optimal coverage and desired effect. Sold as a single rod-pocket panel measuring 42-inch wide in your choice of 63-inch, 84-inch, or 95 inches long lengths. Coordinating valance measuring 42-inch wide by 21 inches long. Coordinating valance sold separately. Tone on tone textured weave panel is available in burgundy, chocolate brown, gold, ivory and river blue. Rod sold separately. Polyester/Cotton blend. Machine wash gentle cycle, tumble dry, do not bleach. Imported. Glad I purchased. Good quality curtains for the price. The Eclipse Canova curtains were a great price, especially as I needed so many of them to cover a wall of windows from floor to ceiling. 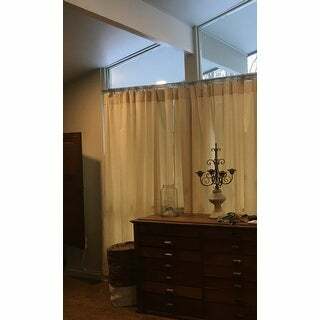 Aside from the privacy aspect, I was looking for a curtain that could help hold in the heat, which it does a decent job. I personally wasn’t looking for total blackout curtains, which is why I purchased the ivory colored ones. They certainly do block a lot of light, but not all, as you can see from my photo. Once ironed, they make for nice winter curtains. Love the looks of this curtain. Totally blocks out light coming into the room. 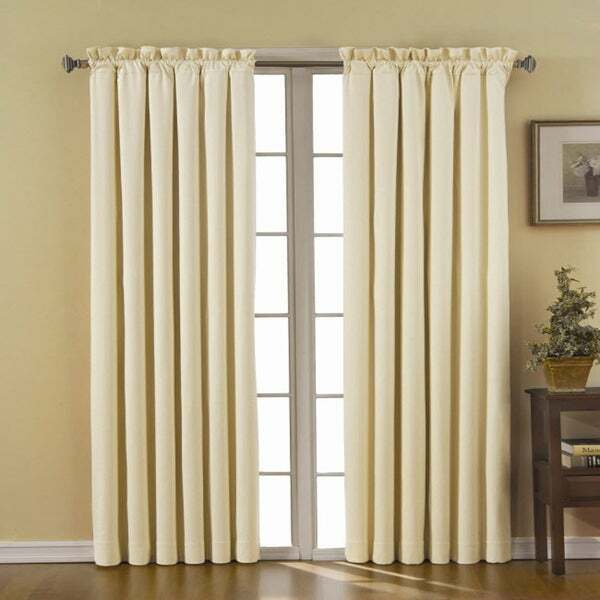 I ordered these curtains in ivory, they have no light blocking qualities at all. They are also poorly made, very creased and have a cheap rough polyester feeling to them. Very out dated styling, poor quality materials and no light blocking ability; they were returned. These are wonderful curtains. Heavy material that truly blocks all light. They are the perfect addition to any room. The ivory color is truly that .... sometimes ivory can look more soft yellow but not these. I paired these with a pair of ivory Sheers and a rubbed bronze double curtain rod and Tada it looks awesome. I eneed up returning these as the River Blue shade was much more subdued in person. I was hoping they had more of a aqua hue, but they weren't vibrant at all - the color while pretty is very subtle and didn't didn't work with the colors in my bedroom so I returned. The curtains seemed a nice quality however. These curtains are truly blackouts! I love them. What I like best is that they are heavy, nice material and good quality. They slide so easily on the rod due to the large grommet holes at the top. I really am happy with this item. These were a little thinner than what I was expecting but the price was good. These are perfect, just as described. Like the valances, the drapes are not very heavy. They are creased from the packaging and the creases are noticeable, even after following the directions to get rid of them. They are somewhat cheap looking. We were disappointed in our purchase not only in their appearance but in their advertised function. These curtains are perfect. The length and color are true to specifications. The quality for the price is really nice and the thin foam backing it great for insulation and sun blocking. I just received them today (1-17-19) and I haven't hung them up yet, but I really like them. Can't wait to see how they will look. I Love these curtains! I have an old Victorian home in the deep south. I installed these on a window on the side of the house that gets a lot of heat from the sun rays! In order to keep the cooling bill low during the hot summer days-room darkening curtains are essential. These really do the job and are very elegant looking! Bought these for "winter" curtains. They definitely keep the rooms much warmer and quieter. They will be the perfect fit for my bedroom since I an changing the color scheme in my master bedroom I didn't want to purchase a new comforter set so I just went with new curtains,bed skirt, and valance I already have a Grey Duvet cover and this works out just.All the colors are in the Grey family. "Is the IVORY color -really- going to blackout light? There are conflicting messages in the Customer Reviews. Do the IVORY (not other colors...IVORY) curtains REALLY block out bright lights from out or doors, or not? Thanks folks..."
This is a thermaback panel. Regardless of the color for the front of the panel, each Canova Panel has a white foam backing, which has a blackout light filtration of 98% - 99%. "can you hang these with clip rings or is it grommet"
This panel does not have grommets, but rather rod pockets. The pockets require a 1 to 1.5-inch rod. "how wide is one panel?" Each panel is approximately 42 inches wide. "Is there a picture for the gold? Do you recommend two or three panels for an 84 inch width? Thanks! Johnrichard"
Yes there is a picture of the gold. At least three panels for an 84" width. These are not blackout at all. There is still light that comes through and I got a darker color than the gold. "Is this a two panel set?" This item features one panel per order. It is in the colors I need and the right length as well as it is insulating. Light color with "black out" capability. "Can these curtains be shortened?" They can be self shortened we cannot alter the.